Wait Times. Show Times. Special Offers. Get it all with the Canada's Wonderland mobile app. The New and Improved Canada's Wonderland App! 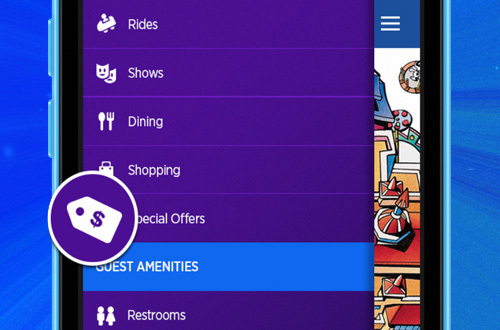 Make your day better than ever with the Mobile App and FREE Park-wide Wi-Fi! Make the most of your time at Canada's Wonderland with ride wait times at your fingertips. Store your Season Pass on your phone and never leave home without it. Receive special money-saving ofers and notifications reserved exclusively for those who carry the mobile app. Never forget where you parked. Pinpoint your parking spot with the Canada's Wonderland app and enjoy your day in the park. That’s easy! The app is available on iOS and Android phones. 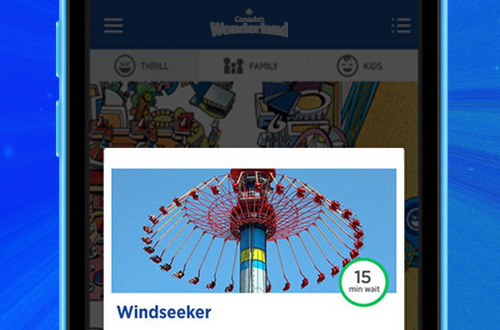 Simply go to your App Store and search for “Canada's Wonderland.” Download for FREE and the app will appear on your phone’s home screen. Why can't I view ride wait times? Are the ride wait times accurate? We do our best to base ride wait times off of the length of the queue lines. The ride wait times in the app reflect the ride wait times displayed at the entrance of each ride. How do I store my Season Pass on the app? Can this be used for entering the Park? 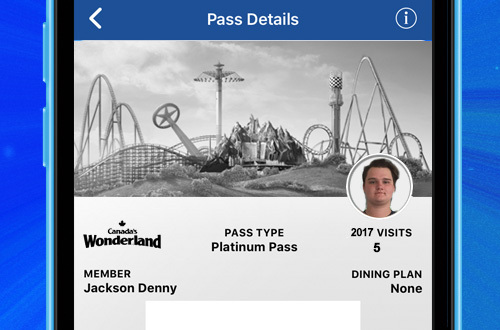 If you store your Season or Platinum Pass on the app, you will be able to use the app to enter the Park as well as receive your 15% off discount at most dining and merchandise locations. To store your Season Pass, open the app and navigate to the map view. Click the menu in the top left corner and select “My Season Passes.” Select the “+” option in the top right corner and scan the barcode or QR code that appears on the back of your Season Pass card by selecting the red barcode button OR manually enter your 8 digit Season Pass number located at the very bottom. Can I store my family members Season Passes on the app? Yes! Follow the same steps from FAQ #4 (see item above) to enter other Season Passes into your app. How can I redeem special offers that I receive on the app? Special offers will appear in your app and through notifications to your phone. To view your offers, open the app and navigate to the map view. Select the menu in the top left corner. Select “Offers & Notifications” under the EXPLORE tab. Here you will be able to select any available offers and redeem them at their respective locations by showing the offer to the Canada's Wonderland associate. Help! I am not receiving the special offer notifications from the app. How can I ensure that I am notified of exclusive app offers? If you are not receiving special offers and notifications from Canada's Wonderland, you first need to make sure that push notifications are enabled for the Canada's Wonderland mobile app from your phone’s settings. Even if you do not choose to receive push notifications, all offers and messages will still appear in the Offers & Notifications tab in the app. To view all available offers, open the app and navigate to the map view. Select the menu in the top left corner. Select “Offers & Notifications” under the EXPLORE tab. Please Note: Some offers are valid for a limited time only and will disappear once the deadline to redeem has expired! How do I access FunPix through the app? Navigate to the map view of the app. Select the menu in the top left corner. Select “My FunPix” from the menu and log in using the login information you received when purchasing your FunPix. This is a one-time login and from here you will be able to view all of your FunPix photos! I do not have an iOS or Android phone. How can I access my FunPix account? If you do not have an app-capable phone, you can still access your FunPix account from any web browser. Visit myfunpix.com to access your FunPix photos. How do I use Car Finder? Open the app and navigate to the map view. Select the menu in the top left corner. Select Car Finder (second available option in list). When you park your car, select “Save My Location” and the app will remember where you parked. 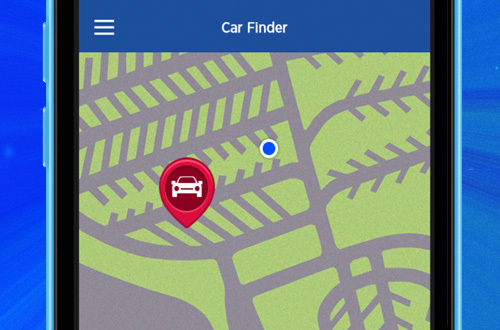 When you travel back to return to your car, refer to the location that the app saved. I'm lost! How do I get directions to a certain point of interest in the Park? Finding your way around the Park just got easier. Open the map view of the app and choose your desired point of interest or destination where you would like to navigate. Choose the “Go Here” option and the app will automatically provide a blue dotted line path with the fastest route to your destination! I want to save on parking, does the mobile app have a special deal for that? You can save on parking in advance of visiting Canada's Wonderland by buying online at canadaswonderland.com or through the Canada's Wonderland mobile app. Open the menu in the top left corner of the app and choose “Buy Tickets, Meals & More.” Choose parking from the next menu and you are on your way to saving money on parking! Will the app use a lot of data? Connect to our FREE Park-Wide Wi-Fi network anytime you are in Canada's Wonderland and your phone won’t use any data! In order to connect, simply navigate to your phone’s network connections and select CW-GuestWiFi to connect. You will not be redirected to a login or terms & conditions page, once you have chosen the CW-GuestWiFi, you will be connected. How do I connect to the FREE Park-Wide Wi-Fi? You must be inside the Park to have access to Canada's Wonderland’s FREE Park-Wide Wi-Fi. In order to connect, simply navigate to your phone’s network connections and select CW-GuestWiFi to connect. You will not be redirected to a login or terms & conditions page. Once you have chosen CW-GuestWiFi, you will be connected.